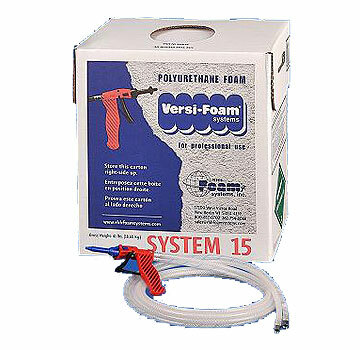 PRODUCT: VERSI-FOAM SYSTEM 15 SPRAY POLYURETHANE FOAM KIT. CLASS 1 FIRE RATED FOAM, 180 BOARD FEET (15 CUBIC FEET), 1.75 PCF, R-7.7. PRICE/KIT. (standard ground shipment only). BEST MATERIALS LLC IS AN INDEPENDENTLY OWNED AND OPERATED DISTRIBUTOR OF VERSI-FOAM® AND ITS RELATED PRODUCTS. THESE PRODUCTS ARE INTENDED FOR PROFESSIONAL USE ONLY. Call for special freight rates on multiple systems. FEATURES: VERSI-FOAM CLASS 1 systems contain additional flame retardants. This formula is classified as Class I in accordance with ASTM E-84 with a 25 Flame Spread and a 225 Smoke Developed Rating. This means that the foam is flame resistant, it is not fire proof. These systems are suitable for use in inhabited buildings, including residential applications or any applications in which flammability is a concern. Versi-Foam is a very high quality high density foam. The systems come ready to use. No other equipment is necessary. The System comes with: the two chemical components, the patented U-CONTROL dispensing gun, 10 foot hoses, ten mixing/spray nozzles, 3 fan-tip nozzles, pair of nitrile gloves, wrench and instructions. State of the art design assures positive performance of unit. The System 15 is a MEDIUM size kit. The density of the foam is 1.75 pounds per cubic foot free rise or 2 pounds per cubic foot in place. The foam will expand six times its original volume and is tack free in 30 to 45 seconds. The foam is 97% closed cell, has an R-value of 7.7 per inch and is recommended for most commercial and industrial applications, including air sealing, condensation control, sound deadening, structural enhancement, tank and pipe insulation, roof repair, marine flotation and gas tank encapsulation, truck and trailer insulation, sculpting and molding medium, pool and spa insulation, and many more. The System 15 is packaged in ONE carton weighing about 40 pounds, and includes the two chemical components, patented U-CONTROL dispensing gun attached to two 7.5 foot hoses and ten multi-purpose mixing nozzles. Theoretically, it will produce 180 square feet of cured foam at a 1" thickness, or 15 cubic feet. AP EXTENDED Fan-Spray Nozzle Kit: 10 extended nozzles, 3 Fan Spray Tips, Tank Wrench, Nitrile Gloves, Petroleum Pack, Instructions. Used with Class-I (closed & open cell), Class-I SR (closed cell): CL9, CL15, CL31, CL100, 9SR, 15SR and 50SR. Price/Kit.